BOSTON, January 11, 2010 – Technomad LLC, a leader in weatherproof loudspeakers and audio systems since 1995, will exhibit for the first time at this year’s ISE show in Amsterdam (Booth #3C138), taking place February 2-4 at the RAI Exhibition Center. Technomad is most well known for its versatile loudspeaker range that offers outstanding voice clarity and musical quality, along with broad dispersion, long throw and unmatched durability in both indoor and outdoor environments. In 2009, the company also introduced a range of narrow dispersion loudspeakers with 90×40 and 60×40 under its popular Berlin brand – the largest loudspeaker in the Technomad family. The Schedulon™ is ideal for use in themed entertainment, high-quality music playback, simulated environments, sports, schools and universities, and commercial security applications. The Schedulon provides instant, manual playback of up to 99 knob-assigned, user-loaded audio files from a front-panel screen, and allows automatic playback on a user-defined schedule based on an internal clock or synchronized network time server. Introduced in mid-2008, new features include an internal power backup option that provides 20 minutes of battery-powered redundancy in the event of power loss. The battery keeps all scheduled playback events on target for approximately 75 minutes. The Schedulon immediately ‘wakes up’ at the current time to resume playback of all scheduled content after battery power expires and the unit is restarted. PowerChiton modules unite a high-performance, passively-cooled amplifier with an IP66 rated, low-profile enclosure. Available in three sizes (130, 250 and 500 Watts), all PowerChiton modules come with standard mounting feet; optional accessories include pole mount adaptors and specialized hardware to install the modules on the back of Technomad loudspeakers. 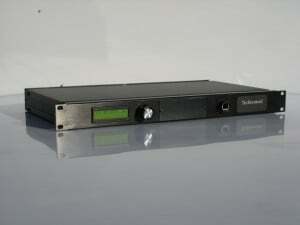 New upgrades include IP and RF networking options, an internal mixer and additional input options. Technomad has also added two standard inputs to all three power levels of PowerChiton modules: a high-quality line level input for improved site-wide audio that is ideal for both voice (paging) and musical output; and a second input that can be used for local audio or as a secondary audio source. The internal mixer adds balance to improve and maintain audio levels out of the amplifier modules en route to loudspeakers.